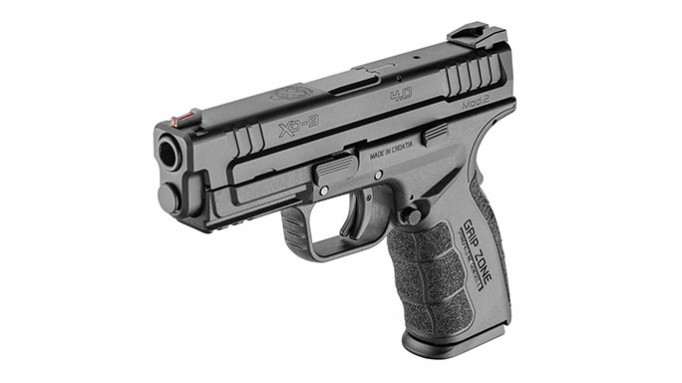 Review: Springfield Armory XD MOD.2 Service Model | Eagle Gun Range Inc. The Springfield Armory XD MOD.2 is a redesign of their XD. While the MOD.2 sub-compact comes in 9mm, .40 cal, and .45 ACP, the 4” service model as yet comes chambered only in 9mm. While there are several consequential design features on the pistol, Springfield has made quite a big deal about their GRIP ZONE ® design and texturing. I’ll touch on this feature in more detail, but I say now that there is more marketing there than functionality. There is, however, plenty to enjoy and the MOD.2 brings some very nice ergonomic features many shooters will like. As I found and will expound on here, the MOD.2 is slightly different from most service model pistols. It makes me wonder if Springfield is working on cultivating and securing a niche in the pistol world with this model. I spent some quality time with the MOD.2 and found precious little to dislike. Why Consider the Springfield XD MOD.2 Service Model? The 4” XD MOD.2 is a service model, but not necessarily a full-size pistol. While one could conceivably carry it as an IWB, concealed pistol, it would be somewhat difficult to do so, owing to the full-size grip. Its primary purpose is as an OWB service model sidearm. The MOD.2 is slightly unusual in an interesting way. Unlike many service model pistols, the XD MOD.2 has a design that minimizes frame and slide width and, perhaps because of this feature, its 16+1 capacity is on the low side for a service model sidearm. 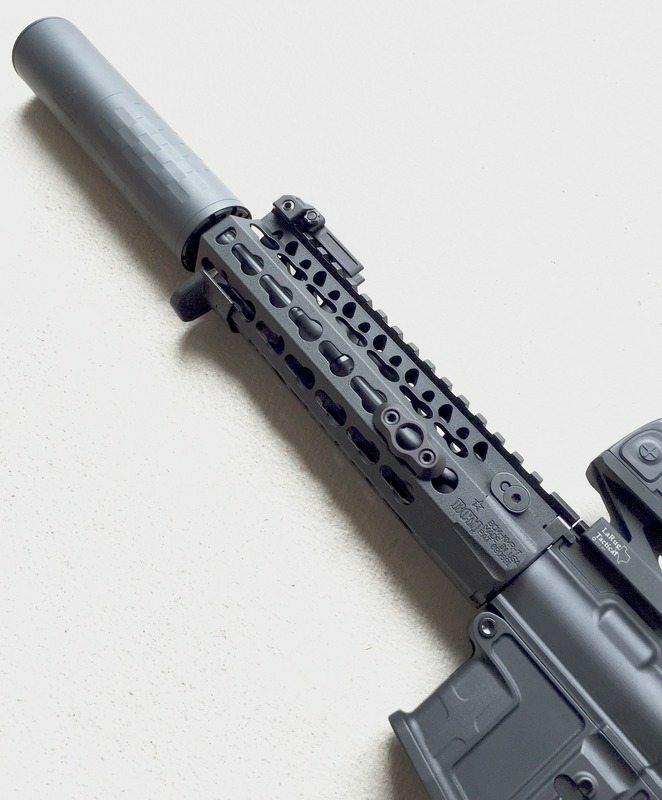 While most service models have an average 4.5”– 5” barrel, the MOD.2 sports a slightly shorter 4” barrel. These features make the MOD.2 into almost a hybrid or bridge between a compact and a service model pistol. It occurs to me that with open carry coming to us here in Texas next month, the Springfield XD MOD.2 could make for an interesting and useful choice for open carry. Not everyone wants a honking 3-pound heater on their belt. The MOD.2 provides the option of a slightly smaller, slimmer, lighter-weight sidearm, but with a full-size grip and decent (if not great) capacity. As with most pistols, I found both good and bad while shooting the MOD.2. The first thing I noticed was that holding this pistol made my medium-sized hands feel a bit bigger. The slimmer frame and shorter stretch from back to front put more of my finger into the trigger guard. I’m used to shooting Glocks, so I had to make slight adjustments in grip to get a similar approach to the trigger. This is anecdotal, of course, but it does begin to describe the grip size and contour. I think people with medium-to-small hands will enjoy this grip. I found the MOD.2 to be very accurate. After I got used to the grip and trigger, I was shooting noticeably smaller groups at 10 to 15 yards than I normally do with my Glock 19, which has almost exactly the same barrel length. And this even with the relatively high bore axis on the MOD.2, which is as high as one might find on a hammer-fired pistol. I’m not a fan of the bore axis, but performance didn’t seem to suffer. Part of its accuracy I attribute to the trigger, which has none of the grit found in many striker-fired pistols. The trigger is a bit long on take-up and reset, but it is buttery smooth; much better than I remember on my old XD(m). Shorten the press length by half and it’d be a near perfect trigger. In any event, I got used to it. The XD MOD.2 is a very comfortable pistol to hold. The ergonomic features of the grip and frame are well done. I found nothing to argue with there. What I found less than satisfying was the controllability of the pistol when firing, due to a complete lack of texturing on the frame for the support hand. With my dry hands, the right hand was comfortably anchored to the grip. The texturing is suitably abrasive for this hand, but my support hand was skating on ice, so to speak. While the GRIP ZONE ® is great for the strong hand, there is absolutely no texture on the frame for the support-hand positions (meat of the thumb/palm and the forward thumb positions). The complete lack of traction meant that my support hand was sliding around while firing and I had to make grip adjustments after the second or third and subsequent shots. Now, as something of a grip-texture snob, I find fault with ALL polymer frames and even my beloved Glocks must be stippled before I’d take them anywhere other than the safe and dry confines of a strict indoor gun range. So I mention this flaw in the MOD.2’s frame only to point out that the GRIP ZONE ®, while somewhat nice, is for the strong hand only. It’s pretty, but it is no silver bullet. The 16+1 capacity is on the low side for a service model 9mm, with just one more round than Glock’s compact G19. With a grip that is a full half-inch taller than the G19, I would have expected 2 extra rounds. But as mentioned before, the slim profile of the frame comes at the cost of more rounds. That said, this true full-grip service model is a bit lighter and slimmer than others, so there is a tradeoff some people may find ideal. The XD MOD.2 is aesthetically more attractive than the original XD, but the design updates are functional and consequential, too. The slide, which comes in black or silver finish, has been reshaped to be slimmer than before and the slide serrations, while nice, terminate at the rear with a deep, easy to grab cut; a simple, but consequential feature. The disassembly lever is slimmer than before and more like you’ll find on the XD(s) model, which helps preserve the overall narrower width. In that same vein, the frame has cutouts behind the trigger area that, aside from removing material and creating attractive contours, provide a slightly improved access for the trigger finger. This combined with the rounded cutout under the trigger guard makes for a very snug and comfortable strong-hand fit. The sights are very nice, with white-dot rear sights and a fiber optic front sight. Both are adjustable with dovetail fittings. The rear site is serrated to prevent glare. The slide features a chamber-loaded indicator on top and a striker-readiness indicator on the back plate. Magazine release controls are available on both sides, making the MOD.2 friendly for righties and lefties and ambidextrous training or fighting. All of these are nice features that most folks will appreciate. The remaining feature I’m not so keen on, grip texturing aside, is the “GRIP ZONE” carved into the frame’s untextured grip area. It just makes the pistol look like it was made by Hasbro or something. Almost reads as, PUT YER HAND HEEEYER. I confess that I only put about 300 rounds through the XD MOD.2, but it ran just fine with Blazer Brass 115gr ball, Federal Premium HST, and Hornady Critical Duty. Fed just fine and every trigger pull resulted in BANG. The one thing that troubled my shooting experience is that the slide never locked open on the last round, owing to where I place my strong-hand thumb. My hand size and grip convention placed my strong-hand thumb on top of the slide-lock lever. This prevented the lever from engaging when the mag ran dry. Were I to carry one of these, I’d have to spend time changing my grip convention. Surely this will not be a problem for all or even most folks. This is an aesthetically attractive, highly accurate pistol that sports a narrow profile and relatively light weight despite it being a service model. The grip is very comfortable, it is small-hand friendly, and the entire frame has ergonomic appointments many will enjoy. The trigger, while perhaps a bit long, is very smooth. The sights are of good quality and easy to pick up. The slide serrations, especially at the rear, make this an easy-to-rack pistol. The slim profile and lighter weight make this an interesting alternative to heavier, bulkier service model sidearms. I’ll have to get nitpicky to call out flaws here. The sights, while quite nice, sport a sloped rear sight that will make one-handed slide racking slightly less reliable. The trigger is a bit too long for my taste. The capacity is perhaps a bit low for a service model 9mm and the grip could use some better and more strategically placed texturing. Like all Springfield Armory pistols, it has a superfluous grip safety (I hold all external safeties to be an invitation to injury and death). Oh, and the “GRIP ZONE” carved into the frame is a bit comical and garish for an otherwise elegant pistol. This is a very comfortable pistol. Fits like a glove. The only flaw is the lack of appropriate support-hand texturing for multi-shot control. Other than that, shoots great! I can’t really speak to reliability given my limited exposure to it. But it is a Springfield Armory pistol. I’ve owned a couple and have never had one fail on me. There are plenty of aftermarket replacement parts and accessories for the XD. Trigger parts, included. The Springfield Armory XD MOD.2 is a consequential and worthy redesign of the XD. There is a lot to like here and in the past few years I’ve learned to be a fan of Springfield’s pistols. They’ve upped their comfort game with the MOD.2 and have given other manufacturers something to aim for. It’s not perfection, but I have yet to find the perfect pistol. Many will surely find the XD MOD.2 close to their ideal of polymer pistol perfection. I highly recommend giving it a tryout. Maybe rent one at the range and see what you think! Thank you for the break down my friend. I’ve owned an XD9 now for 6 months. I use it as my go to range gun and have put 1000 rounds easily through it. SUPER reliable and accurate. Once you hold it, you will understand. I LOVE THIS PISTOL!! Will be getting another one to carry instead of my XDs9. Very helpful. I’ve just ordered mine. They only thing I didn’t like while testing it was the mushy trigger, but as you say, it fits my hand like a glove, so I’m really hoping an after-market trigger will make it better and shorten the reset. “professional guns smiths and safety experts”, as you claim to be, aren’t going to call it a “clip”. Good article, thanks for the insight on this fine pistol. I’ve had mine since June of last year. I bought one of the XD Mod 2 Sub-Compacts before that, which got me over my general bias against the XD series of pistols. Whether in the Sub-Compact or Service version, these pistols are exceptionally easy to shoot well at speed. The recontoured grip and Grip Zone texturing is optimal in my experience for excellent control of the pistol facilitating quick recoil recovery in rapid strings while not being so aggressive that it digs into my skin when worn under a T-shirt. Mec-Gar 18-round magazines work reliably and make up for any perceived shortcoming of the stock magazines. Usually, I can find something about any firearm I have that is a nagging fault, but even though I could never be bothered to touch any of the original XD pistols, the updated series is so well executed that I can find nothing to complain about. And with street prices starting at $75 and more below some of their key competitors, the Mod 2 series presents a value proposition that is very hard to ignore, even if price is a not a limiting factor. Thanks for the review, Andy. I appreciate you not boring us with a history lesson on the Springfield XD series . You got right to the point and that was fantastic. I’ve owned a Springfield XD Mod 2 subcompact for the past year and a half and it’s an incredible pistol, easily the equal of my Glock 19 or S&W M&P 9c. It’s hard to go wrong with any of these pistols, however, my Mod 2 is probably the best of the bunch for me.